Canada Day Long Weekend on the Range! aanii! boozhoo and Hello there! I hope you’re having a great long weekend and a beauty kick off to your summer. Out here on the open range its nothing but bird songs and the great green and blue. Good ole Crackers the white pooch was snoozing on the steps awhile ago, I should mention its around 630 a.m. Sunday morning, and I was busy in here fuddle duddling on this computer when a deer wandered onto the east lawn! It didn’t take long for the pooch to get wise to that! The two of them went blazing across the field and if you had money on it you’d have done alright if you were laying on the deer. They’re still out there sorting things out. Other than that, there hasn’t been much action since before sunrise. 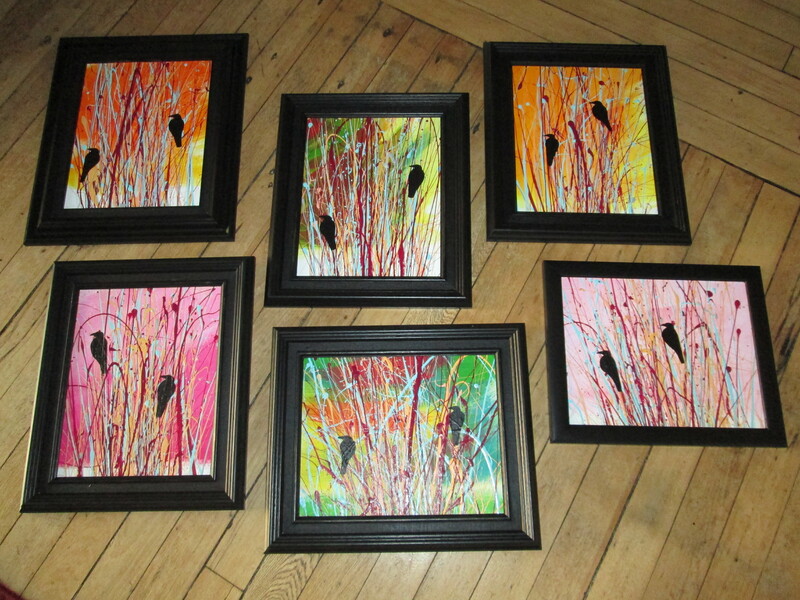 So here is a photo of a recent batch of paintings! Those are 8×10 inches, acrylic on canvas boards and framed up nicely. I decided to go in a new direction for a few months as I’ve run the woodland deal dry. You can see these paintings plus the last of the woodland pieces right here on the range during the Manitoulin Art Tour, coming up on the weekend of July 19, 20, and 21. Everything is for sale of course! Also coming up: Spirit Art by the River! Monday through Friday all through July. Start time is at 2 p.m., runs 2 full hours, all art supplies included and no artistic experience is necessary! We will be covering things like The Art Journal, Introduction to Landscape using the Personal Tree and Mask Making. Expect to get your feet wet. And if you want to see where we’ll be conducting the workshop, take a look at my facebook page and you’ll see a little photo spread of the magical places we’ll be in. You need to email in advance if you plan on attending the workshop. That would be: twinravens@gmail.com, we can go over the details once you contact me. And I look forward to teaching the senior’s art class at the NEMI library starting Monday morning, July 8th! Hope to see you there. Well that’s all the news that fits! Remember!!! Spirit Art by the River, Monday through Friday all through July: it works wonders!